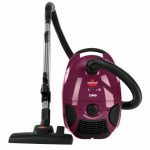 If you are the one that are looking for new lightweight canister vacuum and your home are mostly hard floor surfaces, then the Bissell Hard Floor Expert Multi-Cyclonic Canister Vacuum (model 1547) is for you. The machine is specially designed for homes with mainly hard floors and limited carpets. The cleaner is reasonable in pricec that can be owned by average users. In fact, to best utilize this sweeper, the surface has to be real smooth for the nozzle to seat well with the floor and create suction and spin the brush. So if you have some wooden floors with DEEP grains/grooves then this cleaner might not as good as you may expect. Also, if your house has many pet hairs to clean; this may not the best cleaner for you. Anyhow, this review article will give you more in-depth understanding on this sweeper so you can decide whether to get this canister cleaner or not. Before that, just to let you know that this cleaner was chosen as one of the best bagless canister vacuums by our editor. Compact and lightweight canister vacuum for easy storage and maneuverable. Multi-Cyclonic Technology provides longer yet excellent suction for your cleaning needs. Multi-level filtration ensures fresher air and reduces dusts and allergens at home. Easy Empty dirt tank let you opens from the bottom hygienically. Multi-Surface foot let you pick up anything on area rugs and carpet without much effort. Turbine hard floor brush designed to be touch on dirt and gentle on all floors. 18-feet of power cord let you clean the average room and it come with auto cord rewind feature. Just to let you know that this cleaner is designed for hard floors including the laminated floors in mind, and you can use it on any smooth floors and expect to have a great suction. The sweeper also comes with two nozzles; the Multi Service Professional can be used on both hard floors and on carpets while the Turbine Foot Attachment is for use on hard floors. Also, this is a bagless canister vac so you don’t have to pay additional fee for the bag and dirt cup is very easy to remove, empty and put back. To further save your cost, the filter is washable as shown in the video below. 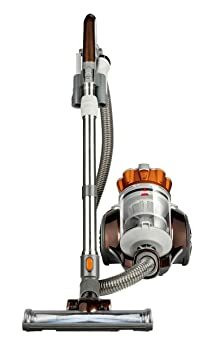 So, this is definitely an ideal choice if you want to get an efficient yet affordable hard floor cleaner, click here to check out the latest price at Amazon.com. Every product has it strengths and weaknesses as of this canister vac, following are some of the things that you need to know when considering of buying this cleaner. A compact, lightweight and quiet cleaner. With power rating of 7.3 amps, it’s designed to keep floors safe from scratches and marks especially on hardwoods. 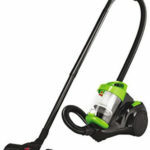 Great for hard floors and pet hair cleaning especially picking things up close to the wall was easy with this vacuum. Multi-level filtration retains most of the dirt and particles and leaves your house with fresher air. Easy empty dirt tank with just push of a button you can remove, empty and put back without hassle. Adjustable telescoping wand that can easily control (extend or retract) for your cleaning needs. Not efficient in cleaning the carpet especially high pile carpet. Less attachments or accessories along with the cleaner. Some users complain that the plastic support where the hose connects to the handle will break off, so handle with care. If your house has mostly hard floors (wood, tiles or any hard surfaces), then this cleaner could be ideal for you. Beside the suction is nice and easy to maneuver or carry around, the canister vac also very quiet and you can do the cleaning anytime even at night. The machine is very well build and it’s powerful enough for you cleaning needs as the soft brush turbine tool spins purely on suction power. You will experience a pleasant cleaning experience since the wand is extendable. The retractable cord is another plus point but many users prefer a longer cord. So, this sweeper isn’t up to the task for large areas/homes or where higher volumes of detritus to be sucked up. Bottom line, if you have smooth hard floors and are looking to clean it off all fine dust then there is nothing better than this little gem. The price is also affordable and Amazon is offering a free shipping for this device. 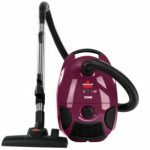 Click Here to Check Out the Current Price of Bissell Hard Floor Expert Multi-Cyclonic Canister Vacuum.